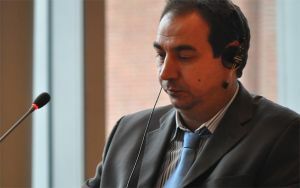 Ahwazi Arab refugee Jalil Sharhani spoke of the massacre of 40 members of his family at a Hague tribunal on Iran's mass killings of political prisoners. Sharhani told the court that his 65-year-old father was a simple farmer, but was arrested and executed along with 16 other close relatives during the violent mass purges under Ayatollah Khomeini. A further 24 distant relatives were also killed. He said: "The executions were carried out because the persecuted Ahwazi Arabs of the oil-rich Al-Ahwaz region demanded their basic ethnic rights. I have submitted evidence to the court that the executions were brutal and carried out without a trial. Their corpses were thrown into fields only an hour after their arrests." The Iran Tribunal campaign was established in October 2007 in response to a call by families of the political prisoners who were murdered and massacred in the prisons of the Islamic Republic of Iran in the 1980s and the survivors of this human tragedy. Under a fatwa by Khomeini, all who were in opposition to the regime were labelled apostates and put to death. Up to 30,000 people were killed in the purges.